November is tradionally snake month here. Started out with a bang this morning. Coral snake inside the security door wound around the latch box. Now coffee fertilizer. Not a snake expert, but the ID rhyme goes - " Red touch black, safe for Jack. Red touches yellow, kills a fellow. Thecoral snake will have bands of red touching smaller bands of yellow. That looks like one of the Lampropeltis species or commonly named Tropical Milksnake or Tropical Kingsnake. 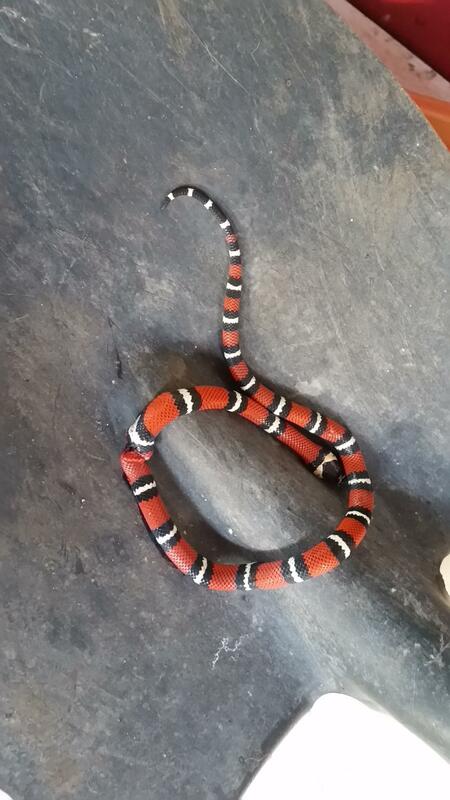 I am no expert but it looks a false coral snake according to Julie's book if I have identified correctly. Not seriously venomous to people only to prey. The pic needs to show the head more clearly. Some false corals eat other snakes. Rhymes don't work here...this is Panama where everything is a bit different. I've heard milk snake or false coral. Two Panamanian old-timers say serpiente venenosa...peligroso...after viewing the remains. I take no chances especially with the area outdoors around the house where my dog roams. After Eric (Cajun Eric of 'Two Guys and a Cooler) lost his weimeraner to a coral a couple of years ago, I've been ever vigilant. Dogs, unlike cats, want to inspect up close and personal and sniffing or trying to play may bring disaster. Have now dispatched 5. The corals, true or false seem to be more at home in the Palo Alto-Alto Lino area...like the fer de lance are more prevalent in Brisas. True or false...it was inside wrapped around the security latch - inside. And dropped to the floor - inside. Inside = death. No wiggle room (pardon the pun). Now the true or false coral is doing a great job as coffee fertilizer. There are many colored coral snakes in Panama. The Snake lady gave a presentation last year at BCP. Treat all snakes as deadly ones and you'll figure it out after you haven't been bitten. Just to be clear: the "Snake lady" did NOT say to treat all snakes as deadly. Snakes serve a vital function in an area's ecology. Herpetologists, including the Snake lady, preach learning more about snakes so as to be able to identify the poisonous from the non-poisonous. The Snake lady, as well as reference books on Panama snakes, say that the red-on-yellow rhyme does NOT apply to Coral snakes here. And, yes, there are many false corals and many different colors of coral snakes in Panama. Identification is made by the head. 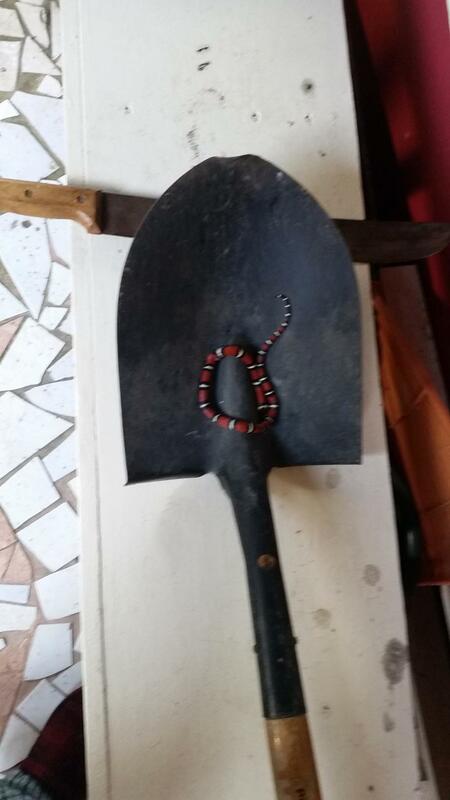 I confess, however, that this is complicated and tricky, so it probably is safer to rid your property of anything that appears to be a coral snake, particularly if you have pets. As to locals proclaiming a snake poisonous, I've never met a snake that my gardener didn't think is poisonous. He proclaims most of them to be fer de lances, even obviously harmless garter snakes and the like. Panamanians on the whole are like Hil; they kill all snakes. This is not an environmentally sound practice. There are a lot of people who would disagree with that statement. Looks like you killed a Milk Snake which eats rodents and other snakes. If you see a large black snake be sure to kill that too...its main diet is the Fer de Lance. I would recommend if you're going to live here in Panama, learn the good snakes from the bad snakes. What I killed was a snake, venomous or not, inside my house. I don't need a herpetology degree or any outside snarky assessment to know that I did the right thing - for me and mine. Having lived here for over 12 years, I'm well aware of what living creatures inhabit this area. Your lecture has fallen on deaf-by-choice, not uneducated, ears.